A New York Times Bestseller John Flammang Schrank--a lonely Manhattan saloonkeeper--was obsessed with the 1912 presidential election and Theodore Roosevelt. The ex-president's extremism and third-term campaign were downright un-American. Convinced that TR would ignite civil war and leave the nation open to foreign invasion, Schrank answered what he believed to be a divine summons, buying a gun and stalking Roosevelt across seven Southern and Midwestern states, blending into throngs of supporters. In Chattanooga and Chicago, he failed to act. 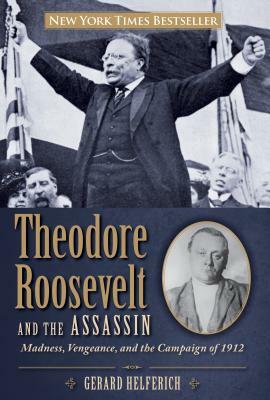 In Milwaukee, on October 14, Schrank crossed TR's path again--BANG Theodore Roosevelt and the Assassin is the dynamic unfolding account of the audacious attempt on Roosevelt's life by a lone and fanatical assailant. Based on original sources including police interrogations, eyewitness testimony, and newspaper reports, the book is above all a fast-paced, suspenseful narrative. Drawing from Schrank's own statements and writings, it also provides a chilling glimpse into the mind of a political assassin. Rich with local color and period detail, it transports the reader to the American heartland during a pivotal moment in our history, when the forces of progressivism and conservatism were battling for the nation's soul--and the most revered man in America traveled across the country campaigning relentlessly against Howard Taft, Woodrow Wilson, and Socialist Eugene V. Debs in what historians agree was the first modern American presidential contest. Gerard Helferich is the author of the widely praised Humboldt's Cosmos, which was a Discover magazine Science Bestseller; High Cotton, which received the 2008 Authors Award for nonfiction from the Mississippi Library Association; and Stone of Kings, an Indie Next List "Great Read."